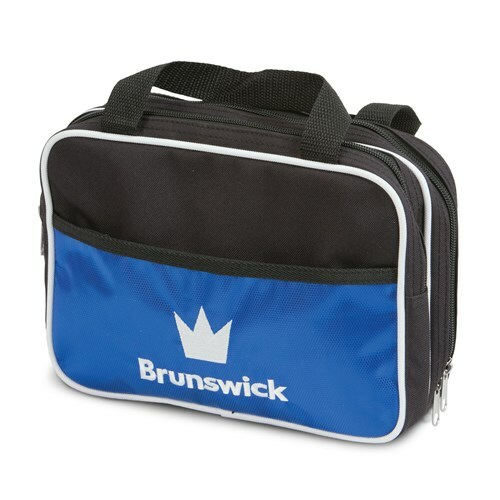 The Brunswick Accessory Bag is the perfect companion for storing extra bowling accessories. This carry bag has three storage areas and is made of durable material. Hello will this bag attache to a rolling ball bag? and if not do you have any small accessory bags that'll attche to a rolling ba? Hello. You can slip this over the handle of the roller. My two nephews need something to carry their bowling shoes in. Can a pair of size 13 and a pair of size 14 bowling shoes fit into this ONE bag? Unfortunately this bag is much too small to fit shoes in. This was designed for tape, and smaller bowlers tools. You may check for a shoe bag or even a 1 ball tote could be used to fit 2 pair of shoes. What is the size dimension of this bag? The dimensions of this bag are L-10" D- 4" H- 8"
Due to the time it takes to produce the Brunswick Accessory Bag Black/Royal ball it will ship in immediately. We cannot ship this ball outside the United States.